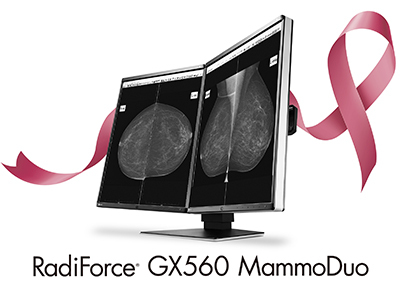 Hakusan, Japan, June 20, 2018 – EIZO Corporation (TSE: 6737) today announced the release of the RadiForce GX560, a 21.3-inch 5 megapixel monochrome medical monitor ideal for viewing mammography and breast tomosynthesis. It comes with space saving features and new functionality for improving reading room efficiency. The GX560 utilizes a low temperature polysilicon (LTPS) liquid crystal display, which can reach a maximum brightness of 2,500 cd/m2. This ensures that when calibrated to 1,000 cd/m2, EIZO can guarantee 5 years of use. Furthermore it has a high contrast ratio of 1700:1, displaying deep blacks without any washout. This makes it suitable for faithfully reproducing images for mammography and breast tomosynthesis. For breast imaging, it is common to view images side-by-side on two monitors in order to see all images at once. The GX560 is sold as either a single monitor, or as a combined dual monitor set called RadiForce GX560 MammoDuo to accommodate multi-monitor use. The GX560 MammoDuo includes a unique dual stand that holds both monitors at once. Furthermore, the stand is designed so that the height, tilt, and swivel of the two monitors can be adjusted without creating any gaps between them. When using the GX560 MammoDuo, the combined bezel width is only 15 mm (7.5 mm on each monitor). Additionally, the bezel sits only 2.5 mm above the screen, making it almost completely flush with the screen. All of this helps to reduce distractions when working between the two screens. As the GX560 MammoDuo is two monitors held by a single stand, its size has been significantly reduced compared to conventional side-by-side configurations. It has been reduced by 67 mm horizontally, 36 mm vertically and 20.5 mm in depth. The total space occupied by the monitor has been reduced by 22 %, creating an unrestricted environment with expanded viewing space. The monitor also comes with EIZO’s unique Work-and-Flow functions Point-and-Focus and Switch-and-Go which improve efficiency in the reading room. Point-and-Focus allows the user to select specific areas of the screen and focus on them using a mouse and keyboard. This function changes the brightness and grayscale tones of the selected areas to make interpretation easier. Switch-and-Go allows two workstations to be controlled by a single mouse and keyboard simply by moving the mouse across the screen. Furthermore two workstations can be connected to the same monitors, switching the signals as needed. This eliminates the need for a second mouse and keyboard, and reduces the number of monitors required. Work can progress quicker, and more space is saved in the reading room. The RadiForce GX560 will begin shipping in September, 2018. Date of availability varies by country so contact the EIZO group company or distributor in your country for details. EIZO (TSE:6737), which means image in Japanese, is a visual technology company that develops and manufactures high-end display solutions. EIZO integrates hardware and software technologies with consulting, web hosting, and other services to help customers in business, graphics, gaming, medicine, maritime, and other fields work more comfortably, efficiently, and creatively. Headquartered in Hakusan, Japan, EIZO has R&D and manufacturing facilities in Japan, China, Germany, and the US, and representation in more than 80 countries.